a review of media by a slightly jaded baby boomer. It will be a while before the USA tries to do something like this. I'm kind of amused. I like these comedies, broad and dumb, but pleasurable. 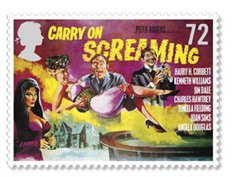 Ideas for stamps are many, but few are chosen. The SF community was trying to get SF writers of the 20th century through the post office, but couldn't get through the management, which decided STAR WARS rated over Robert A. Heinlein, Isaac Asimov, John Campbell, H.P.Lovecraft and a few others. *sigh*. write to : rsiriuse@aol.com I work for a living at the USPS, which is an untapped mine of horror and comedy; I am a half blind half deaf dyslexic cartoonist: what I need is a gimmick.